Looking for ways to expand your reach to additional relevant audiences? 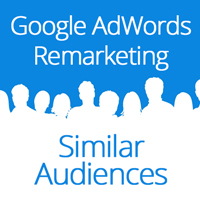 Google AdWords can help you reach people similar to your existing Remarketing audience with the new “similar audiences” feature. Google Remarketing allows you to reach people who have already visited your site and reconnect with an audience that’s interested in your products or services. The similar audiences feature enables you to find people who share characteristics and browsing patterns with your site visitors. By adding similar audiences to an ad group you can now serve your ads to this similar population, allowing you to reach a new group of qualified potential customers. AdWords reviews the browsing activity of millions of users on Display Network sites from the prior 30 days. This data is used within their contextual engine to understand shared interests and characteristics with those people in your remarketing list. Based on this information, they identify a new audience whose interests and characteristics are similar to those of the people in your current Remarketing list. The more characteristics and interests people in your Remarketing lists share, the better this similar audiences feature should work. As your Remarketing audience changes, your similar audience will change as well. A similar audiences list is created based on a Remarketing list that contains at least 500 cookies with enough similarity in characteristics and interests to create a qualifying population for similar audiences. Google will automatically identify which of your Remarketing lists qualify for similar audiences based on a variety of factors including the types of sites that these visitors have browsed. Just click the Change Display Targeting button under the Display Network tab and select an Ad Group. You’ll then click the Remarketing lists link under Interests & Remarketing and the “Show Similar Audiences” checkbox should be automatically selected. If there aren’t any lists that qualify for similar audiences then this option will be grayed out. You’ll see a new list for the similar audience along with the estimated list size right below each qualified Remarketing list which you can then select for addition to your Ad Group. For professional assistance, contact Google AdWords Management Specialists. The similar audiences feature takes the guesswork out of your search for relevant new audiences by automatically finding a large-scale group of potential customers who are similar to your existing site visitors. This feature can help you find qualified customers based on the specific topics that people (in aggregate) were browsing from one of your Remarketing lists before being added to that list. With similar audiences you can boost the reach of existing Remarketing campaigns and drive new traffic to your website site that should have a strong likelihood of being interested in your product or services. Even if these new visitors don’t generate an immediate conversion from your advertising campaign, they have now been added to your Remarketing list allowing for future conversion opportunities through ongoing exposure. By enabling similar audiences, you can grow your Remarketing list dramatically in a way that is both intuitive and easily managed.